Something’s afoot… Wake Up Your Feet! Your feet: they take you everywhere yet rarely receive any attention or appreciation… unless you’ve injured them! 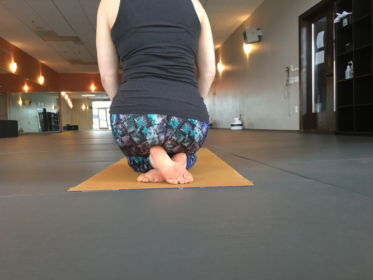 I started yoga thanks to a solid foot injury. With a lot of PT and permission from my doctor, I incorporated yoga into my daily life. The combination of work paid off as I was fortunate to avoid surgery with my case. Your feet bare the brunt not just of your standing yoga poses but moving you from place to place every day off your mat. 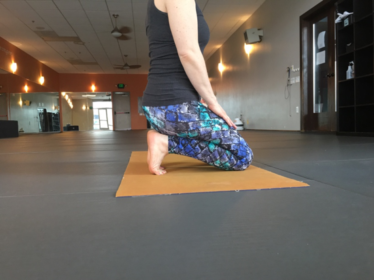 Creating a strong, supple base with your feet is often overlooked and dismissed. Let’s look at why we all need these stretches. In yoga as in daily life, your feet are your foundation for the majority of poses. There are 26 bones, 33 joints, and over 100 muscles, ligaments and tendons just in one foot. (One-quarter of the bones in your body are in your feet!) That’s a lot of moving parts that need to work together to create stability and mobility simultaneously. Medial Longitudinal Arch: This is the one we refer to when buying arch supports at the store. It runs from your big toe mound to your heel bone. 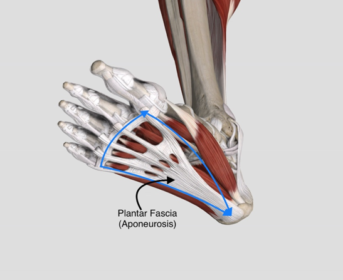 Lateral Longitudinal Arch: Feel from the base of your little toe to your heel bone. For most of us, this isn’t overly pronounced. Transverse Arch: find the base of your big toe and draw a line with your finger to the base of your little toe. You can feel the slight arch. These aches create a dome—the strongest structure found in nature. It has no folding point—no specific point of weakness. Think of it as a trampoline–it gives us spring and shock absorption. We want to avoid rigidity and keep it pliable. Before I practice or after standing around in shoes all day, you’ll find me working with my feet. These still aren’t comfortable but are quite effective. If you have any ankle injuries proceed with caution or skip the first stretch until your ankles are healthy and your provider gives you the green light. Start on all 4’s. Slide your left shin and foot back and to the right until the top of your left foot and ankle rest comfortably in the arch of your right foot. Your knees will be uneven—back out if these causes ANY discomfort in your knees. Sit your hips back until you rest upon your left heel. Start with 30 seconds to a minute adding on time incrementally over several weeks. Stretch your left foot in down dog or all four’s before switching sides. Start on all 4’s with knees and feet separated hip-width distance. Curl your toes under so you are on the balls of your feet. (Be sure to get that sneaky pinkie toe!) Slowly move your hips back to your heels—one day sitting your hips on your heels. You may need a block under your hips. You may also need to stay standing on your knees with toes curled under for some time. Again, accrue time in this pose slowly. Fascia takes time and patience to shift. Give your feet a break and a good stretch. Notice if it changes your yoga poses or relieves the ache of standing for long periods of time. Let me know how it goes!